T Rex Window - Tyrannosaur peeking in your window. 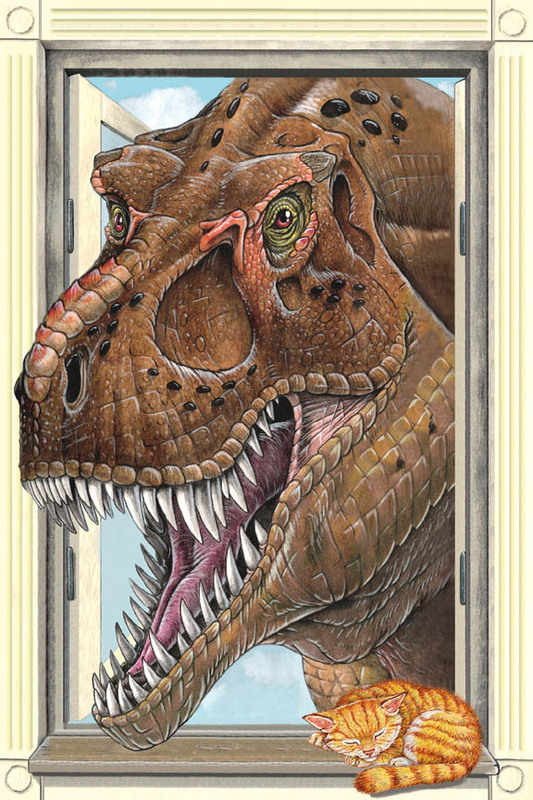 What could be worse than a Tyrannosaur rex peering in your window? The answer: a Tyrannosaur who has crashed through the window and is inside your house. This poster was inspired by the terrifying scene in the movie Jurassic Park in which the world�s favorite dinosaur peered into the tour vehicles, just prior to its attack. This poster captures that "stillness before the storm." Trompe Loi is a highly realistic style of painting developed by French artists to create cabinets, windows, mantels and other architectural elements on bare walls to simulate the effect of the items actually being there. This technique was used to create T. Rex Window. The painted frame simulates a window and Mister Rex is quietly peering in, apparently looking for his next meal. A tiny, fragile kitten sleeps on the sill, oblivious to the threat. For maximum effect, simply "wallpaper" it wherever you want. From a dozen feet away, it looks like the real thing. It great for kid�s rooms, but is also an interesting conversation piece for the office. Just write, "Boss" on it.